We have ‘right-handed’ and ‘left-handed’ matter, and they behave differently–at least with respect to the weak force–and, hence, we have some kind of absolute distinction between left and right in the real world. If ‘right-handed’ matter and ‘left-handed’ matter are not the same, then ‘right-handed’ antimatter and ‘left-handed’ antimatter are not the same either. CP symmetry connects the two: right-handed matter behaves just like left-handed antimatter, and right-handed antimatter behaves just like left-handed matter. In previous posts, I mentioned the so-called Fitch-Cronin experiment which, back in 1964, provided evidence that ‘Nature’ also violated the combined CP-symmetry. In fact, I should be precise here and say the weak force, instead of ‘Nature’, because all these experiments investigate the behavior of the weak force only. Having said that, it’s true I mentioned this experiment in a very light-hearted manner–too casual really: I just referred to my simple diagrams illustrating what true time reversal entails (a reversal of the forces and, hence, of the charges causing those forces) and that was how I sort of shrugged it all of. In such simplistic world view, the question is not so much why the weak force violates mirror symmetry, but why gravity, electromagnetism and the strong force actually respect it! Indeed, you don’t get a Nobel Prize for stating the obvious and, hence, if Val Fitch and James Cronin got one for that CP-violation experiment, C/P or CP violation cannot be trivial matters. You may wonder why we have to go through the trouble of building another clock. Why can’t we just take one of these transparent ‘mystery clocks’ and just go around it and watch its hand(s) move standing behind it? The answer is simple: that’s not what mirror symmetry is about. As Feynman puts its: a mirror reflection “turns the whole space inside out.” So it’s not like a simple translation or a rotation of space. Indeed, when we would move around the clock to watch it from behind, then all we do is rotating our reference frame (with a rotation angle equal to 180 degrees). That’s all. So we just change the orientation of the clock (and, hence, we watch it from behind indeed), but we are not changing left for right and right for left. Rotational symmetry is a symmetry as well, and the fact that the laws of Nature are invariant under rotation is actually less obvious than you may think (because you’re used to the idea). However, that’s not the point here: rotational symmetry is something else than reflection (mirror) symmetry. Let me make that clear by showing how the clock might run when it would not respect P-symmetry. You’ll say: “That’s nonsense.” If we build that mirror-image clock and also wind it up in the ‘other’ direction (‘other’ as compared to our original clock), then the mirror-image clock can’t run that way. Is that nonsense? Nonsensical is actually the word that Wolfgang Pauli used when he heard about Chien-Shiung Wu’s 1956 experiment (i.e. the first experiment that provided solid evidence for the fact that the weak force – in beta decay for instance – does not respect P-symmetry), but so he had to retract his words when repeated beta decay experiments confirmed Wu’s findings. Of course, the mirror-image clock above (i.e. the one running clockwise) breaks P-symmetry in a very ‘symmetric’ way. In fact, you’ll agree that the hands of that mirror-image clock might actually turn ‘clockwise’ if its machinery would be completely reversible, so we could wind up its springs in the same way as the original clock. But that’s cheating obviously. However, it’s a relevant point and, hence, to be somewhat more precise I should add that Wu’s experiment (and the other beta decay experiments which followed after hers) actually only found a strong bias in the direction of decay: not all of the beta rays (beta rays consist of electrons really – check the illustration in my previous post for more details) went ‘up’ (or ‘down’ in the mirror-reversed arrangement), but most of them did. OK. We got that. Now how do we explain it? 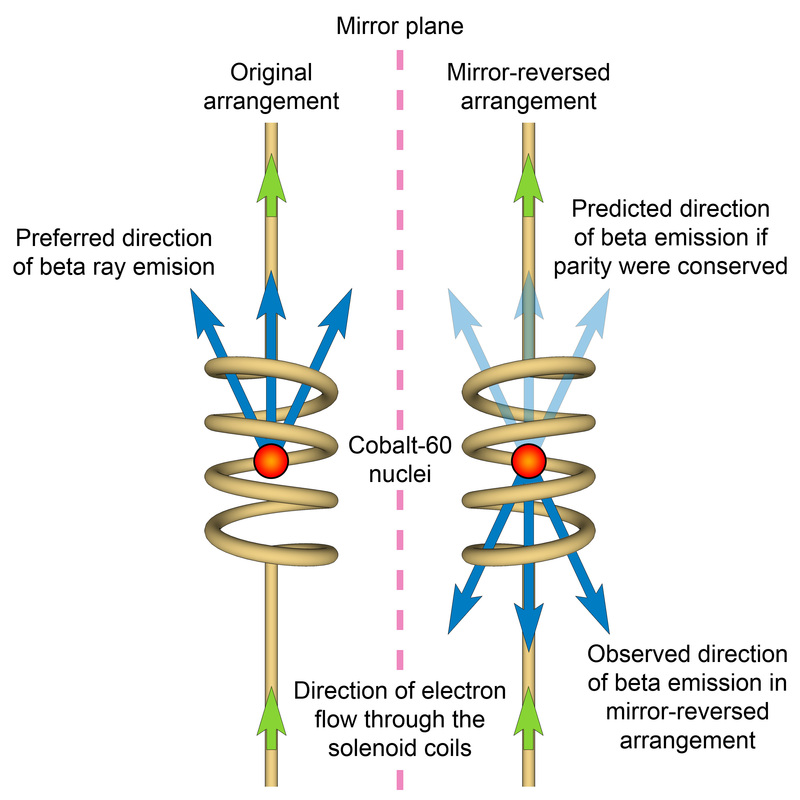 The key to explaining the phenomenon observed by Wu and her team, is the spin of the cobalt-60 nuclei or, in the muon decay experiment described in my previous post, the spin of the muons. It’s the spin of these particles that makes them ‘left-handed’ or ‘right-handed’ and the decay direction is (mostly) in the direction of the axial vector that’s associated with the spin direction (this axial vector is the thick black arrow in the illustration below). Hmm… But we’ve got spinning things in (mechanical) clocks as well, don’t we? Yes. We have flywheels and balance wheels and lots of other spinning stuff in a mechanical clock, but these wheels are not equivalent to spinning muons or other elementary particles: the wheels in a clock preserve and transfer angular momentum. OK… But… […] But isn’t that what we are talking about here? Angular momentum? No. Electrons spinning around a nucleus have angular momentum as well – referred to as orbital angular momentum – but it’s not the same thing as spin which, somewhat confusingly, is often referred to as intrinsic angular momentum. In short, we could make a detailed analysis of how our clock and its mirror image actually work, and we would find that all of the axial vectors associated with flywheels, balance wheels and springs in a clock would effectively be reversed in the mirror-image clock but, in contrast with the weak decay example, their reversed directions would actually explain why the mirror-image clock is turning counter-clockwise (from our point of view that is), just like the image of the original clock in the mirror does, and, therefore, why a ‘left-handed’ mechanical clock actually respects P-symmetry, instead of breaking it. In physics, we encounter such axial vectors everywhere. They show the axis of spin, and their direction is determined by the direction of spin through one of two conventions: the ‘right-hand screw rule’, or the ‘left-hand screw rule’. Physicists have settled on the former, so let’s work with that for the time being. An axial vector behaves differently when mirrored. It changes too, but in a very different way: it is usually reversed in respect to the geometry of the whole space, as illustrated in the muon decay image above. However, in the illustration below, that is not the case, because the angular velocity ‘vector’ is not reversed when mirrored. So it’s all quite subtle and one has to carefully watch what’s going on really when we do such mirror reflections. What’s the third figure about? Well… While it’s not that difficult to visualize all of the axial vectors in a mechanical clock, it’s a different matter when discussing electromagnetic forces, and then to explain why these electromagnetic forces also respect mirror symmetry, just like the mechanical clock. But let’s me try. When an electric current goes through a solenoid, the solenoid becomes a magnet, especially when wrapped around an iron core. The direction and strength of the magnetic field is given by the magnetic field vector B, and the force on an electrically charged particle moving through such magnetic field will be equal to F = qv×B. That’s a so-called vector cross product and we’ve seen it before: a×b = n│a││b│sinθ, so we take (1) the magnitudes of a and b, (2) the sinus of the angle between them, and (3) the unit vector (n) perpendicular to (the plane containing) a and b; multiply it all; and there we are: that’s the result. But – Hey! Wait a minute! – there are two unit vectors perpendicular to a and b. So how does that work out? 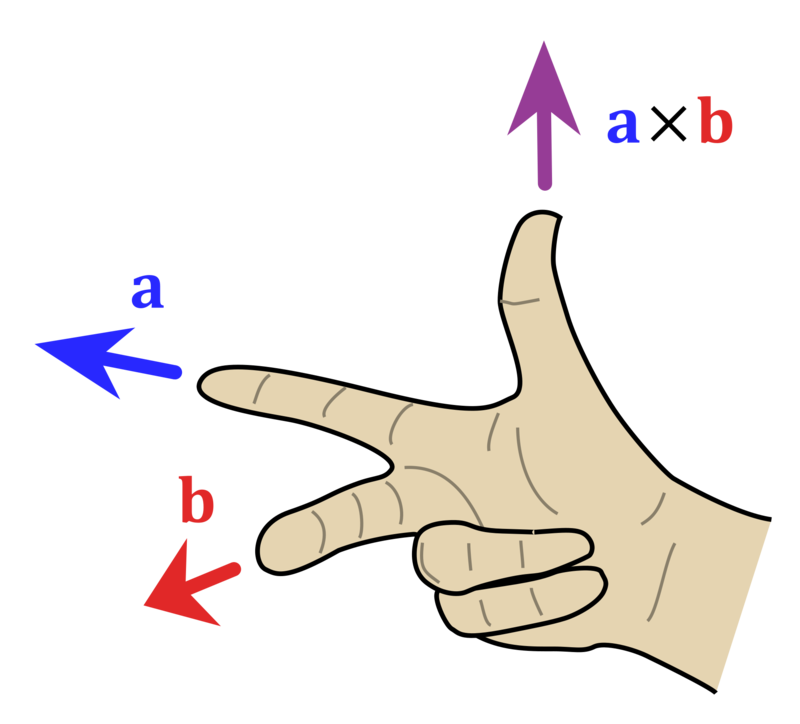 Well… As you might have guessed, there is another right-hand rule here, as shown below. Now how does that work out for our magnetic field? If we mirror the set-up and let an electron move through the field? Well… Let’s do the math for an electron moving into this screen, so in the direction that you are watching. In the first set-up, the B vector points upwards and, hence, the electron will deviate in the direction given by that cross product above: qv×B. In other words, it will move sideways as it moves away from you, into the field. In which direction? Well… Just turn that hand above about 90 degrees and you have the answer: right. Oh… No. It’s left, because q is negative. Right. In the mirror-image set-up, we have a B’ vector pointing in the opposite direction so… Hey ! Mirror symmetry is not being respected, is it? Well… No. Remember that we must change everything, including our conventions, so the ‘right-hand rules’ above becomes ‘left-hand rules’, as shown below for example. Surely you’re joking, Mr. Feynman! Well… No. F and v are polar vectors and, hence, “their head might change, just as the whole space turns inside out”, but that’s not the case now, because they’re parallel to the mirror. In short, the force F on the electron will still be the same: it will deviate leftwards. I tried to draw that below, but it’s hard to make that red line look like it’s a line going away from you. But that can’t be true, you’ll say. The field lines go from north to south, and so we have that B’ vector pointing downwards now. […] OK. Let me try to explain it once again. In reality, it does not matter whether or not a solenoid is wound clockwise or counterclockwise (or, to use the terminology introduced above, whether our solenoid is left-handed or right-handed). The important thing is that the current through the solenoid flows from the top to the bottom. 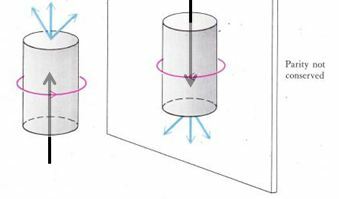 We can only reverse the poles – in reality – if we reverse the electric current, but so we don’t do that in our mirror-image set-up. Therefore, the force F on our charged particle will not change, and B’ is an axial vector alright but this axial vector does not represent the actual magnetic field. […] But… If we change these conventions, it should represent the magnetic field, shouldn’t it? And how do we calculate that force then? So we change ‘right’ to ‘left’ and ‘left’ to ‘right’, and our cross-product rule becomes a ‘left-hand’ rule. But our electrons still go from ‘top’ to ‘bottom’. Hence, the (magnetic) force on a charged particle won’t change. But if the result has to be the same, then B needs to become –B, or so that’s B’ in our ‘left-handed’ coordinate system. We can now calculate F using the ‘left-handed’ cross product rule and – because we did not change the convention that field lines go from north to south, we’ll also rename our poles. If you didn’t get anything of this, don’t worry. There is actually a much more comprehensible illustration of the mirror symmetry of electromagnetic forces. If we would hang two wires next to each other, as below, and we send a current through them, they will attract if the two currents are in the same direction, and they will repel when the currents are opposite. However, it doesn’t matter if the current goes from left to right or from right to left. As long as the two currents have the same direction (left or right), it’s fine: there will be attraction. That’s all it takes to demonstrate P-symmetry for electromagnetism. I guess I caused an awful lot of confusion above. Just forget about it all and take one single message home: the electromagnetic force does not care about the axial vector of spinning particles, but the weak force does. No. There are plenty of examples in the real world showing that the direction of ‘spin’ does matter. For instance, to unlock a right-hinged door, you turn the key to the right (i.e. clockwise). The other direction doesn’t work. While I am sure physicists won’t like such simplistic statements, I think that accepting that Nature has similar ‘left-handed’ and ‘right-handed’ mechanisms is not the kind of theoretical disaster that Wolfgang Pauli thought it was. If anything, we just should marvel at the fact that gravity, electromagnetism and the strong force are P- and C-symmetric indeed, and further investigate why the weak force does not have such nice symmetries. Indeed, it respects the combined CPT symmetry, but that amounts to saying that our world sort of makes sense, so that ain’t much. In short, our understanding of that weak force is probably messy and, as Feynman points out: “At the present level of understanding, you can still see the “seams” in the theories; they have not yet been smoothed out so that the connection becomes more beautiful and, therefore, probably more correct.” (QED, 1985, p. 142). However, let’s stop complaining about our ‘limited understanding’ and so let’s work with what we do understand right now. Hence, let’s have a look at that Fitch-Cronin experiment now and see how ‘weird’ or, on the contrary, how ‘understandable’ it actually is. To situate the Fitch-Cronin experiment, we first need to say something more about that larger family of mesons, of which the kaons are just one of the branches. In fact, in case you’d not be interested in this story as such, then I’d suggest you just read it as a very short introduction to the Standard Model as such, as it gives a nice short overview of all matter-particles–which is always useful I’d think. But kaons are mesons, and so I won’t say anything more about baryons The two illustrations below should be sufficient to situate the discussion. The ‘B’ in ‘B-meson’ refers to the fact that one of the quarks in a B-meson is a b-quark: a b (bottom) quark is a much heavier (third-generation) version of the (second-generation) s-quark. As for the ‘D’ in D-meson, I have no idea. D-mesons will always consist of a c-quark or anti-quark, combined with a lighter d, u or s (anti-)quark, but so there’s no obvious relationship between a D-meson and a d-quark. Sorry. 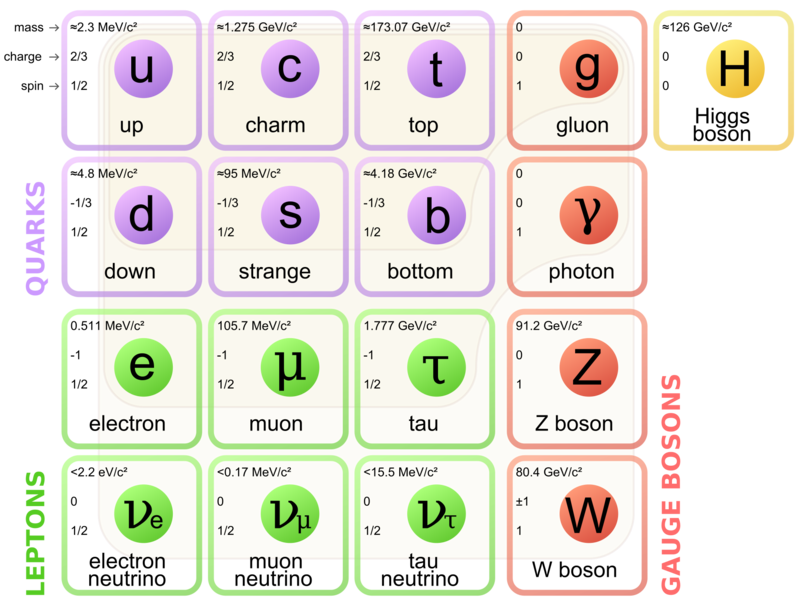 If you look at the quark table above, you’ll wonder whether there are any top-mesons, i.e. mesons consisting of a t quark or anti-quark. The answer to that question seems to be negative: t quarks disintegrate too fast, it is said. [So that resembles the remark on the possiblity of t-baryons.] If you’d google a bit on this, you’ll find that, in essence, we haven’t found any t-mesons as yet but their potential existence should not be excluded. Anything else? Yes. There’s a lot more around actually. Besides (1) kaons, (2) B-mesons and (3) D-mesons, we also have (4) pions (i.e. a combination of a u and a d, or their anti-matter counterpart), (5) rho-mesons (ρ-mesons can be thought of as excited (higher-energy) pions, (6) eta-mesons (η-mesons a rapidly decaying mixture of u, d and s quarks or their anti-matter counterparts), as well as a whole bunch of (temporary) particles consisting of a quark and its own anti-matter counterpart, notably the (7) phi (a φ consists of a s and an anti-s), psi (a ψ consists of an c and an anti-c) and upsilon (a φ consists of a b and an anti-b) particles (so all these particles are their own anti-particles). So it’s quite a zoo indeed, but let’s zoom in on those ‘crazy’ kaons. [‘Crazy kaons’ is the epithet that Gerard ‘t Hooft reserved for them in his In Search of the Ultimate Building Blocks (1996).] What are they really? Kaons, also know as K-mesons, are, first of all, mesons, i.e. particles made of one quark and one anti-quark (as opposed to baryons, which are made of three quarks, e.g. protons and neutrons). All mesons are unstable: at best, they last a few hundredths of a microsecond, but kaons have much shorter lifetimes than that. Where do we find them? We usually create them in those particle colliders and other sophisticated machinery (the experiment used kaon beams) but we can also find them as a decay product in (secondary) cosmic rays (cosmic rays consist of very high-energy particles and they produce ‘showers’ of secondary particles as they hit our atmosphere). They come in three varieties: neutral and positively or negatively charged, so we have a K0, a K+, and a K–, in principle that is (the story will become more complicated later). What they have in common is that one of the quarks is the rather heavy s-quark (s stands for ‘strange’ but you know what Feynman – and others – think of that name: it’s just a strange name indeed, and so don’t worry too much about it). An s-quark is a so-called second-generation matter-particle and that’s why the kaon is unstable: all second-generation matter-particles are unstable. The second quark is just an ordinary u- or d-quark, i.e. the type of quark you’d find in the (stable) proton or neutron. So that’s simple enough. Well… No. Unfortunately, the story is, indeed, more complicated than that. The actual kaons in a neutral kaon beam come in two varieties that are a mix of the two above-mentioned neutral K states: a K-long (KL) has a lifetime of about 9×10–11 s, while a K-short (KS) has a lifetime of about 5.2×10–8 s. Hence, at the end of the beam, we’re sure to find KL kaons only. Huh? A mix of two particle states… You’re talking superposition here? Well… Yes. Sort of. In fact, as for what KL and KS actually are, that’s a long and complex story involving what is referred to as a neutral particle oscillation process. In essence, neutral particle oscillation occurs when a (neutral) particle and its antiparticle are different but decay into the same final state. It is then possible for the decay and its time reversed process to contribute to oscillations indeed, that turn the one into the other, and vice versa, so we can write A → Δ → B → Δ → A → etcetera, where A is the particle, B is the antiparticle, and Δ is the common set of particles into which both can decay. So there’s an oscillation phenomenon from one state to the other here, and all the things I noted about interference obviously come into play. In any case, to make a very long and complicated story short, I’ll summarize it as follows: if CP symmetry holds, then one can show that this oscillation process should result in a very clear-cut situation: a mixed beam of long-lived and short-lived kaons, i.e. a mix of KL and KS. Both decay differently: a K-short particle decays into two pions only, while a K-long particle decays into three pions. That means that the kaon decay processes involved do not observe the assumed CP symmetry and, because it’s the weak force that’s causing those decays, it means that the weak force itself does not respect CP symmetry. You may object that these lifetimes are just averages and, hence, perhaps we see these two-pion decays at the end of the beam because some of the K-short particles actually survived much longer ! No. That’s to be ruled out. The short-lived particle cannot be observable more than a few centimeters down the beam line. To show that, one can calculate the time required to drop to 1/500 of the original population of K-short particles. With the stated lifetime (9×10–11 s), the half-life calculation gives a time of 5.5 x 10-10 seconds. At nearly the speed of light, this would give a distance of about 17 centimeters, and so that’s only 1/100 the length of Cronin and Fitch’s beam tube. But what about the fact that particles live longer when they’re going fast? You are right: the number above ignores relativistic time dilation: the lifetime as seen in the laboratory frame is ‘dilated’ indeed by the relativity factor γ. At 0.98c (i.e. the speed of these kaons, γ =5, and, hence, this “time dilation effect” is very substantial. However, re-calculating the distance gives a revised distance equal to 17γ cm, i.e. 85 cm. Hence, even with kaons speeding at 0.98c, the population would be down by a factor of 500 by the time they got a meter down the beam tube. So for any particle velocity really, all of these K-short particles should have decayed long before they get to the end of the beam line. Fitch and Cronin did not see that, however: they saw one two-pion decay event for every 500 decay events, so that’s two per thousand (0.2%) and, hence, that is very significant. While the reasoning is complex (these oscillations and the quantum-mechanical calculations involved are not easy to understand), the results clearly shows the kaon decay process does not observe CP symmetry. OK. So what? Do we see it somewhere else? Well… Fitch and Cronin got a Nobel Prize for this only sixteen years later, i.e. in 1980, and then it took researchers another twenty years to find CP violation in some other process. To be very precise, only in 1999 (i.e. 35 years after the Fitch-Cronin findings), Fermilab and CERN could conclude a series of experiments demonstrating direct CP violation in (neutral) kaon decay processes (as mentioned above, the Fitch-Cronin experiment only shows indirect CP violation), and that then set the stage for a ‘new’ generation of experiments involving B-mesons and D-mesons, i.e. mesons consisting of even heavier quarks (c or b quarks)–so these are things that are even less stable than kaons. So… Well… Perhaps you’re right. There’s not all that many examples really. Hmm… That’s the last line of the first volume of his Lectures (there are three of them), and so that should end the story really. However, I would personally not like to involve God in such discussions. When everything is said and done, we are talking atomic decay processes here. Now, I’ve already said that I am not a physicist (my only ambition is to understand some of what they are investigating), but I cannot accept that these decay processes are entirely random. I am not saying there are some ‘inner variables’ here. No. That would amount to challenging the Copenhagen interpretation of quantum mechanics, which I won’t. But when it comes to the weak force, I’ve got a feeling that neutrino physics may provide the answer: the Earth is being bombarded with neutrinos, and their ‘intrinsic parity’ is all the same: all of them are left-handed. In fact, that’s why weak interactions which emit neutrinos or antineutrinos violate P-symmetry! It’s a very primitive statement – and not backed up by anything I have read so far – but I’ve got a feeling that the weak force does not only involve emission of neutrinos or antineutrinos: I think they enter the equation as well. That’s preposterous and totally random statement, you’ll say. Yes. […] But I feel I am onto something and I’ll explore it as good as I can–if only to find out why I am so damn wrong. I can only say that, if and when neutrino physics would allow us to tentatively confirm this random and completely uninformed hypothesis, then we would have an explanation which would be much more in line with the answers that astrophysicists give to questions related to other observable asymmetries such as, for example, the imbalance between matter and anti-matter.